You'd think with all the different ways Bandai Namco has improved and bastardized Pac-Man over the years, there just wouldn't be anything left to tackle. But as it turns out there was, and it existed in the form of Pac-Man Championship Edition, one of the most engaging and exciting ways anyone could ever possibly conceive of to play Pac-Man while feeling like it's a completely new experience. Pac-Man Championship Edition 2 comes out of the gate running with bigger and better improvements on the previous release, with alterations and augments that make it as exciting as ever, even if you've played Pac-Man more times than you listened to "Pac-Man Fever," and you know you've listened to Pac-Man Fever. The first thing you'll notice about Pac-Man Championship Edition 2, especially if you played the original one, is that things are a bit different this time around. You'll still run around each course gobbling up pellets while avoiding ghosts, but this time you don't have to explicitly avoid them. They won't kill you on contact, and will only take you out if you happen to run into them while in a special state. So the fundamentals of the original game have changed slightly, which might take some getting used to, but it's all for the better. You'll have to run into ghosts over and over and over again for them to kill you immediately, which offers you some leeway when it comes to creating chains of ghosts. You'll want to grab as many pellets as possible to fill your meter and ten grab fruits after completing that small quest, all the while avoiding the bad guys so you don't accidentally die where you are. This repeats until you've cleared the level. You can also end it by running out of time or dying too many times, which is still a distinct possibility. You won't have to worry too much about ghosts killing you, however, even if you bump into them too much. The same mechanic that made for a whole lot of fun in the last game is back, where you can chain together combo meters by strategically arranging the ghosts wandering each maze. But unlike in the last game, you have to kill off the trains by eating the leader instead of any random part of the chain. It's even more frenzied than the mechanics of the last game, and it's massively satisfying to pick up each chain as you progress. Watching Pac-Man lay the smackdown on an entire group of ghosts is super fun, and really takes the place of why I enjoy Pac-Man in its original form. Aside from the ghost trains, you'll face off against larger ghost boss battles, which aren't so much showdowns against big ghosts but instead even faster-paced levels where you're meant to complete a few different layers of a level that's sped up a bit to make things more difficult for you. I would personally have liked to see enormous ghosts and ways to interact with them directly and then a way to eat the larger one, but that didn't happen here unfortunately. Pac-Man Championship Edition 2 is an amalgam of excellent new augments, though for the most part it stays the same and implements new looks and skins. I'm not sure there's enough that it actually changes from the other game, but there's still plenty here to enjoy and hungrily devour, like Pac-Man and ghosts, if you're a diehard fan or even have a passing interest in the game. Ghost trains are where it's at, and you'll most likely agree. This review is based on a PC download code provided by the publisher. 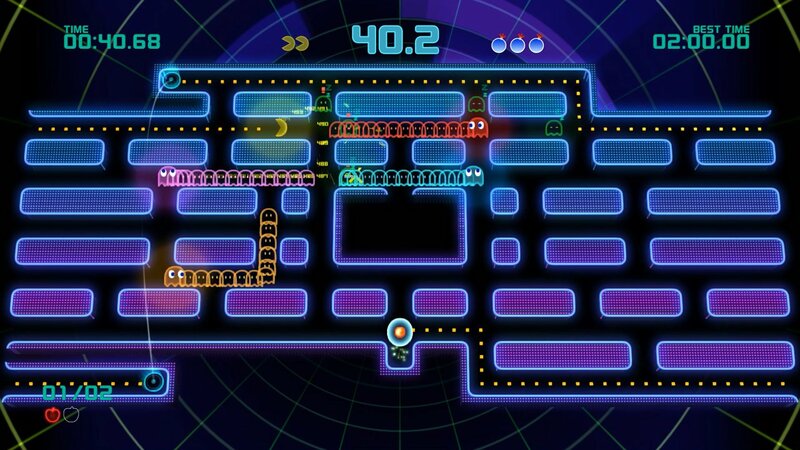 Pac-Man Championship Edition 2 is available digitally for $12.99 via Steam. The game is rated T.
Interesting new tweaks to keep things fresh. Ghost chains are extremely fun to form. Not as many new improvements as you might have expected. I loved the first Championship Edition. DX was okay but I preferred the twists on the original style gameplay to the whole ghost train and bomb thing in DX. This looks like they doubled down on that junk and made it even dumber and easier? I don't understand. Thanks for the review! Staying away.